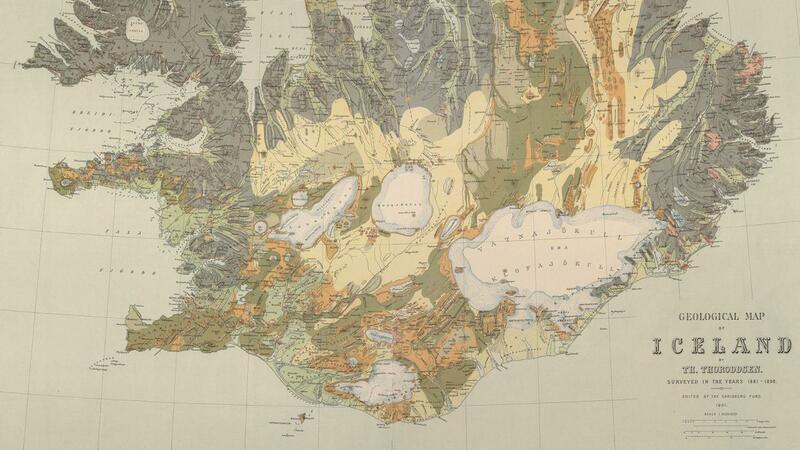 Ash and art helped to craft the first detailed map of all Iceland. The explosive eruption of the Askja volcano in 1875 drew scientific thrill-seekers to explore the new crater. Among them was Thorvaldur Thoroddsen, an Icelandic student in Copenhagen, who acted as a guide for a Danish expedition. He found the maps of the interior imaginative but inadequate, and resolved to complete a comprehensive survey of the whole country. Iceland’s parliament, the Althing, supported him: at a time of Danish rule, an accurate map of Iceland by an Icelander would be a source of national pride. There may also have been a wish to fuel the economy with a new type of tourism. Victorian Britons had begun sailing north to find their inner Odins, and acolytes of William Morris came to admire the tasteful hues of moss and basalt. When we go mapping in the volcanic zones today, we bump around a Hilux truck on rocky tracks and shield our eyes from the midnight sun in a tent or shepherd’s hut. Science has not always been so comfortable. (James Hutton, a visionary Scottish geologist of the 18th century, travelled so long on horseback that he asked Edinburgh’s Enlightenment to “pity the arse that’s clagged to a head that will hunt stones”.) Thoroddsen spent decades in the pale nights of the simmer dim, on horse and foot, noting and drafting, before his map was published in 1901. He would have faced significant hardship in the interior, where travellers feared to tread, expecting bandits, outlaws and trolls. Routes had to be tested across wide, black flood plains riddled with quicksand (sandur), lava fields of broken volcanic glass (hraun) and thundering glacial rivers (jökulsá). All the while, the weather would be roaring past Thoroddsen, freezing his pencil-grip, soaking his notes and blowing field maps into distant papery birds. He withstood all this and made a geologist’s map, stripping back the green velvet to expose the bare Earth in the act of creation. Bloody dots on a dark grey bed of lava mark the spots of recent volcanic vents and fissures. The cones of the deadly Laki eruption look like puncture wounds from a sharpened steel comb. Long arrows mark the scars left as ice carried rock over the country during the last glaciation. The remaining glaciers are rendered pure white, when in reality their edges can be dirty as hell. Older rocks are in gentler tones, the muted palette of the Icelandic landscape under a high, diffuse cloud-base. The theory of plate tectonics now accounts for this striped pattern of young lavas fringed by older basalt at the coasts: Europe and America are being torn apart through the middle of the map. Thoroddsen’s efforts should have directed geologists to this theory well before the 1960s.